Great Products to Craft Delicious Coffee at Home with Artistry! Standard UK P&P for £ 2.49 :: Craft Delicious Coffee at Home with Artistry! 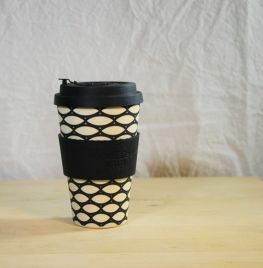 Fantastic Eco friendly, Bamboo fibre, reusable takeaway BASKETCASE ecoffee cup. Help to bring down the number of takeaway cups in landfill by purchasing one of these to get your morning coffee in for the journey to work or school. Light yet sturdy and durable & in amazing colours and patterns. These ecoffee cups are made in naturally organic & sterile bamboo fibre & have been made using a lower-energy, lower C02 emissions manufacturing process. They are also BPA and phthalate free and don't contain petrochemical plastic. The ecoffee cups are dishwasher safe(cup only) and are finally recyclable when you have finished using in in a few years. At that point simply crush it and soak in boiling water then bury in your compost heap! The lid and sleeve can be recycled with your curb-side recycling. Pretty much the perfect cup to take with you for your morning coffee! This design now features a stopper in the lid which helps to prevent spills, and to keep your drink warmer for that little bit longer. The sleeve is a new design too which provides added insulation between the mug and your hand. The capacity of this ecoffee cup is 400ml, or 14oz.